This Mothers Day I told my husband exactly what I wanted…. a dishwasher. It wasn’t a suggestion, I was going to get my dishwasher. New, used, whatever…as long as it worked. We have been married seven years and have never had a (working) dishwasher. He (gasp!) 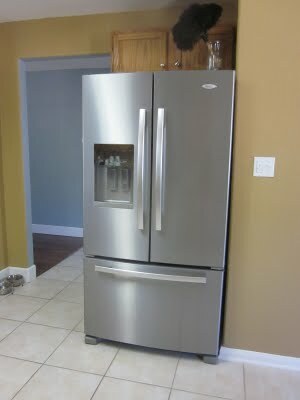 said I could get a new one, a stainless steel one to match the future other appliances we wanted. So I started my research…consumer reports, checking websites for reviews, scouring the web for the cheapest price. We don’t take purchases lightly around here. That’s when I discovered that three weeks away, Memorial Day weekend was Texas tax free appliance weekend. I didn’t even know that existed! Isn’t Texas awesome? Memorial Day weekend also hosted sales out the wazoo, rebates, military discounts, price matching discounts…you name it. I started to get excited… real excited. I thought maybe, just maybe, if I played my cards right I could convince Adam to buy all our appliances that weekend. Well, we did! YAY! Everything in my kitchen works and we ended up getting an amazing deal at Lowes. I went in with my stack of paperwork and ads for price matching and picked out my salesman. Made him sweat…he even asked Adam not to leave me alone with him, haha. Actually he was a really nice guy and I didn’t have to be too hard on him. Anyway, we ended up *pretty much* getting everything for the price of the fridge. Awesome. So here is some before and after pics. 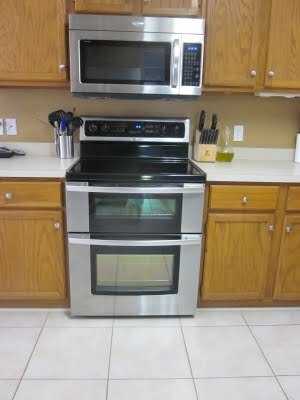 Now that our appliances are in I am DYING to start our kitchen renovation. 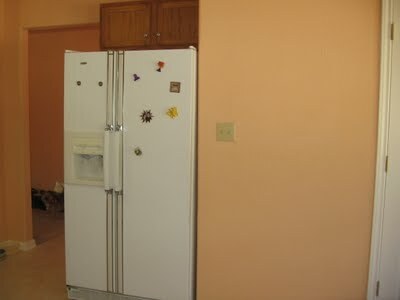 The awesome appliances somehow make the kitchen look both better and worse. Notice the color swatches in that last picture? I can’t make up my mind about colors….I need your opinions. First let me show you what we are for sure doing so you can get an idea. This way we can get a totally custom look for the price of a gallon of paint, some lumbar, and our time. Plus no more weird space between the cabinets and the ceiling. Love, love, love that dark grey/blue. I’m thinking that might make our kitchen a bit dark? I don’t know…we have a really light filled kitchen so that probably wouldn’t be a problem. 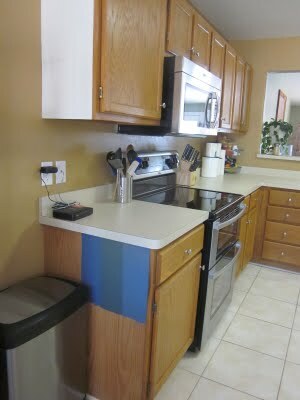 Its just a big deal to repaint cabinets if I hate them. Beautiful? Boring? 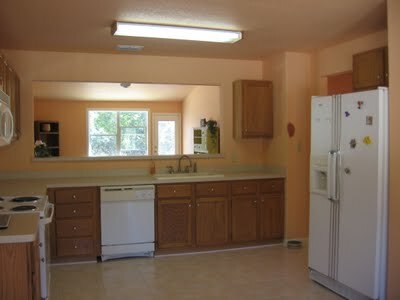 The last thing I want is to have a kitchen that looks like everyone else’s! I know you have an opinion! Let me hear it! 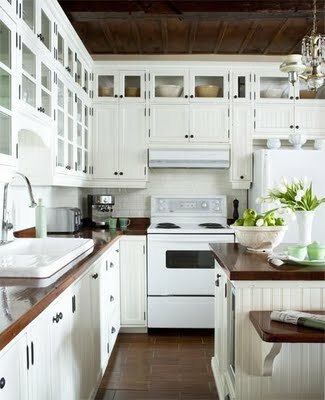 First, let me say that I love the open shelving under the cabinets. I've never seen that before; I think it's awesome. I also really like the dark gray/blue color. And after being a HGTV junkie for quite some time now (lol), I can tell you that I've heard more than one expert say that dark colors don't make a room feel smaller – it's a myth. But I suppose that can be subjective and probably depends on the room. 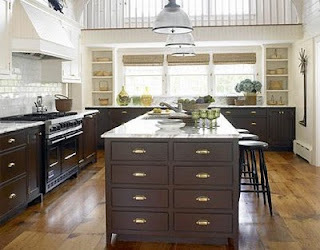 I think that the dark lower cabinets will actually provide an anchor in the room with the white upper cabinets making things feel more spacious. 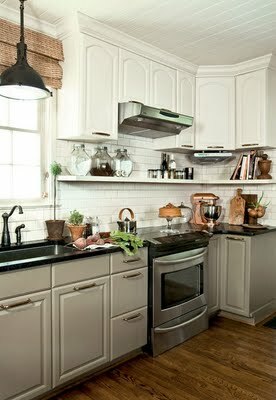 If you keep the light tile, the dark cabinets would also be a fabulous contrasting element. And I think that “stormy” blue would also mesh beautifully with the stainless. So, there's my two cents. Ha! Have fun with the remodel!! Ok, so here are my two cents. Don't go with the brown bottom cabinets. Brown is often overused and I am guilty of it just as much as the next person. It is a safe color, and Ash, I have known you long enough to know that you don't like to go with what is safe. I really like both of the suggestions that krystal and elisa said. they both would do well with your new curtains. i can't get over your new curtains. I have bay windows like that in my living room, and when i saw your curtain idea i just about flipped. IF ONLY I didn't have to put my couches up against my wall like that! Otherwise your idea would have been stolen in 2 seconds flat! Speaking of stealing, I need to raise my cabinets too. Who decided that leaving a useless foot between the cabinet and ceiling would be good? I have to use every inch of my place to get my family and my stuff comfortably in our condo. So, that's what I'll do. Why didn't I think of that before? and then the open shelf…I like it. I may also steal that too. So all in all, don't go brown. Oh and don't go white either. That's safe. Be bold as you always have been. 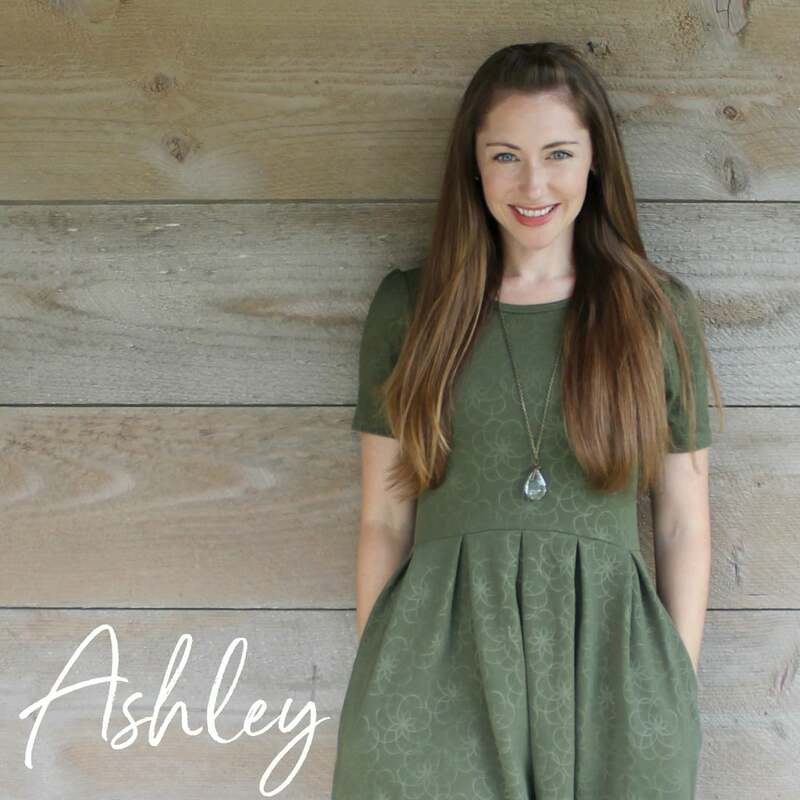 White is lovely, but it doesn't strike me as you, Ash. I love the blue in your inspiration picture. 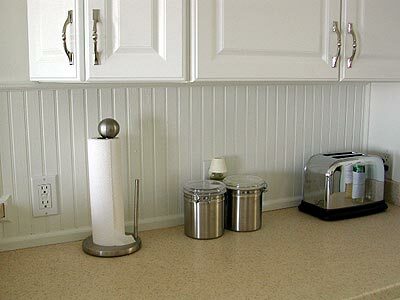 I agree with some of the above ladies that brown is over done and I've never been one who's wanted an all white kitchen regardless of how beautiful some of them can look. Just my two cents from a stranger who found my way to your blog from Craptastic! 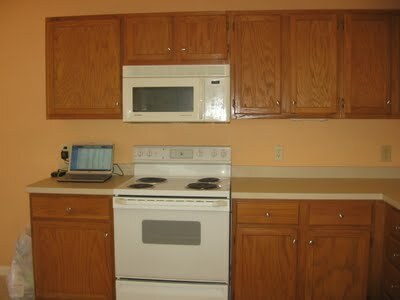 If it were me I would go with one colour on the cabinets. I love the two tone but I like to change my wall colour fairly often and with one tone of cabinets I am able to have much wider choice in colours. I've had white and it drove me crazy but you might be either more tolerant or tidier than I am. 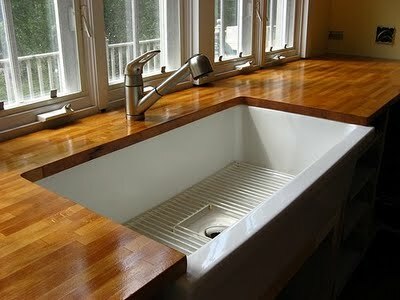 When it comes to your bathroom or kitchen countertops, formica countertops always make an excellent yet inexpensive choice. I love the deep blue/gray color. 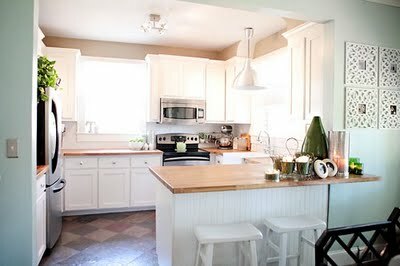 I have two toned cabinets and LOVE them!! Mine are a sage green on the bottom and creamy white on top. I wanna raise mine also…you think it would look weird if they didn't sit flush on a ceiling (I have a pitched roof)? As an architect and interior designer, I have to say I love your ideas (I've never actually seen the shelf below the cabinets)but my biggest concerns for your kitchen are all the things you're not thinking about – or at least not mentioning. You have a great expanse of floor and celing (with terrible lighting) and that really wide opening between your kitchen and family room. Spatially it eels awkward. Are you going to do an island? These are the things that are going to make or break it. Think long and hard about these materials and how you can utilize the opening differently. Maybe it doesn't need to be so wide. Maybe you could do some built in shelves there too. Maybe it could be divided up into multiple openings etc. These are the things that are truly going to make your kitchen “WOW”. P.S. I vote for the gray / blue. 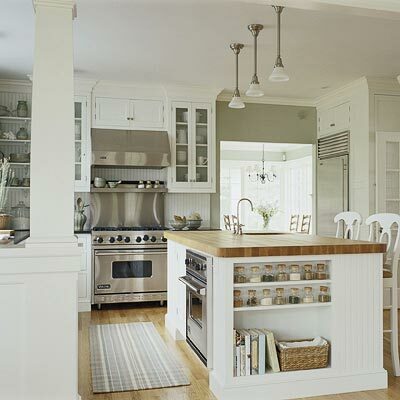 What a brilliant idea to raise the cabinets and put a shelf in between! 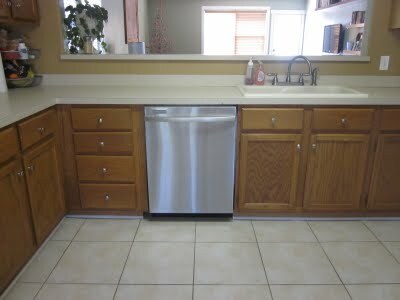 We did our kitchen last year and boy, those new cabinets were so pricey! I also vote for the stormy blue-grey cabinets. 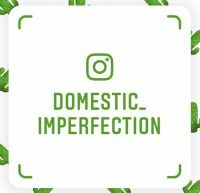 I think it will look gorgeous. I LOVE your kitchen! I am shopping for appliances now, and would love to know which ones you went with. I was trying to see the brand in the pics. And now that you’ve had them a while, are you still happy with them? I’ve been reading reviews on CR also, but there are just so many options. Yours look awesome! Wow this is so true what your title says LOL if you give a girl anything they want more. 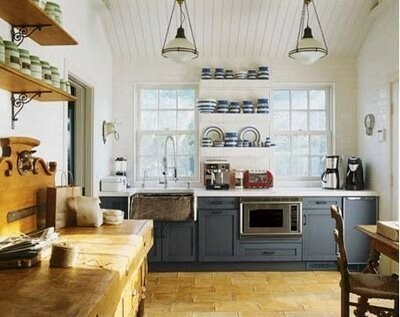 I love the Kitchen and what you did.